Phil Donovan and Peter Nunns write this weeks entry in the MRCNZ15 project- The New Zealand Land Value Model. MRCagney prides itself on innovation in transport and land use research, and the New Zealand Land Value Model (NZLVM) is a recent example of this. From 2016 to 2018 we were commissioned by the Ministry of Business, Innovation and Employment (MBIE) to inform the National Policy Statement on Housing Development Capacity (NPS-UDC) including both policy and implementation. The NPS-UDC was created in response to New Zealand undergoing a substantial increase in the demand for urban land which resulted in what many term a ‘housing crises’ and very high urban land prices. The stated purpose of the NPS-UDC was to address this problem to “support productive and well-functioning cities… [and] provide adequate opportunities to develop land for business and housing to meet community needs” . In the initial stages of the NPS-UDC, we were involved in shaping the policy and scoping out a methodological framework for implementation. In conjunction with Covec, we developed the price indicators framework for the NPS-UDC which was a set of diagnostic measures for analysing urban housing markets . The outputs of this report was a ‘long’ list of potential indicators for understanding urban housing markets and from this ‘long’ list MBIE and MfE selected several market indicators that were deemed the best for understanding urban development capacity. Of relevance to NZLVM, were the price indicators for the zone boundary differentials for both rural / urban and industrial zones. The construction of these price indicator involved mapping out the rural / urban boundaries (RUB) and the industrial boundaries in order to understand the change in the value of land both inside and out; a big ‘price discontinuity’ or change in price would indicate a constraint on the supply of the particular type of land e.g. a lack of urban land. In order to analyse these spatial price discontinuities, the NPS-UDC needed to be able to model land values at these zonal boundaries; this was the origin for the NZLVM. Constructing NZLVM involved the following key challenges: (1) handle large amount data, including ~3 million land parcels; (2) use sophisticated econometric regression to model land values; (3) automate all the work so that it can be repeated easily in the future. To meet these challenges of robust reproducible research, we developed the R package NZLVM. We chose R, because it provides a suite of modern data science tools for analysing and visualising data of all kinds (tabular, geospatial, etc.) and because it is the MBIE’s in-house programming language. So we could tackle the job and, once finished, share our source code with MBIE (via Git and Gitlab) for them to maintain and rerun at their convenience. 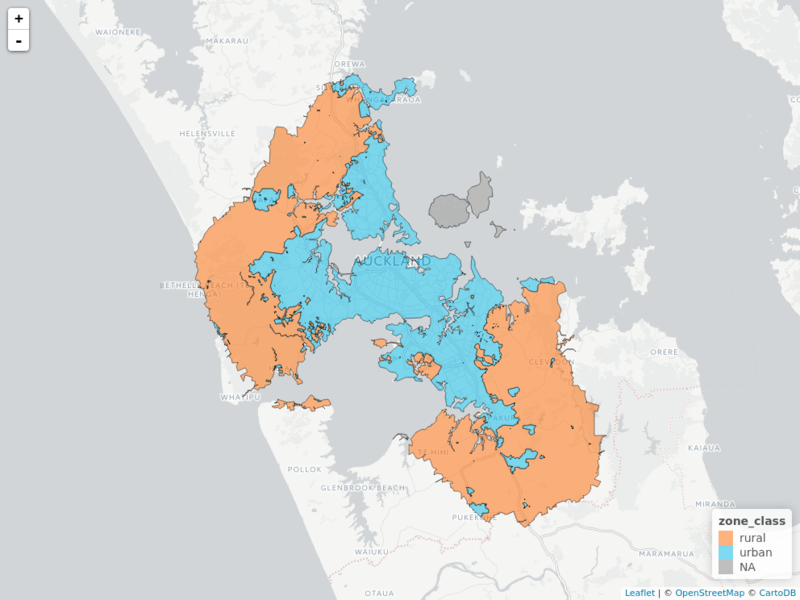 As an example of some of our model outputs, here is a map of the Auckland Region rural-urban boundary (~1 million parcels). 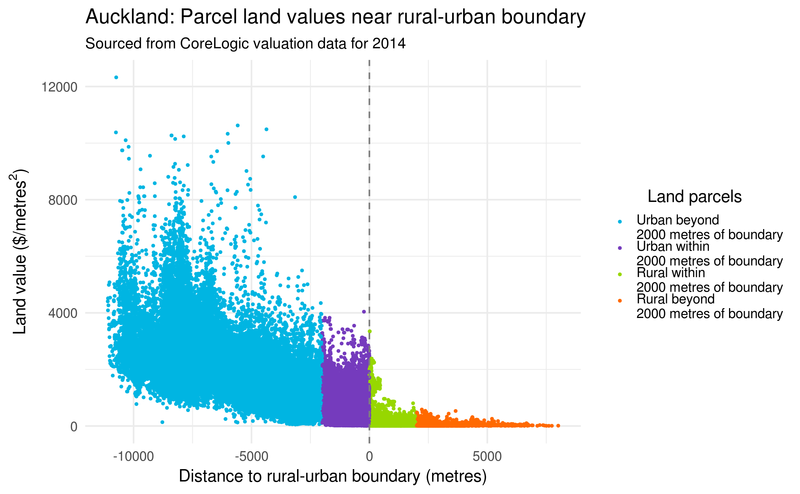 And here is a scatter plot of land values near the RUB, demonstrating a price discontinuity. 6. The presence of infrastructure (e.g. water and sewage systems). The outputs of this model was the price per square metre of being inside and outside of the boundary after all the other factors had been controlled for. The table below presents the estimated differences between the rural and urban boundaries for the urban areas analysed in the NPS-UDC. 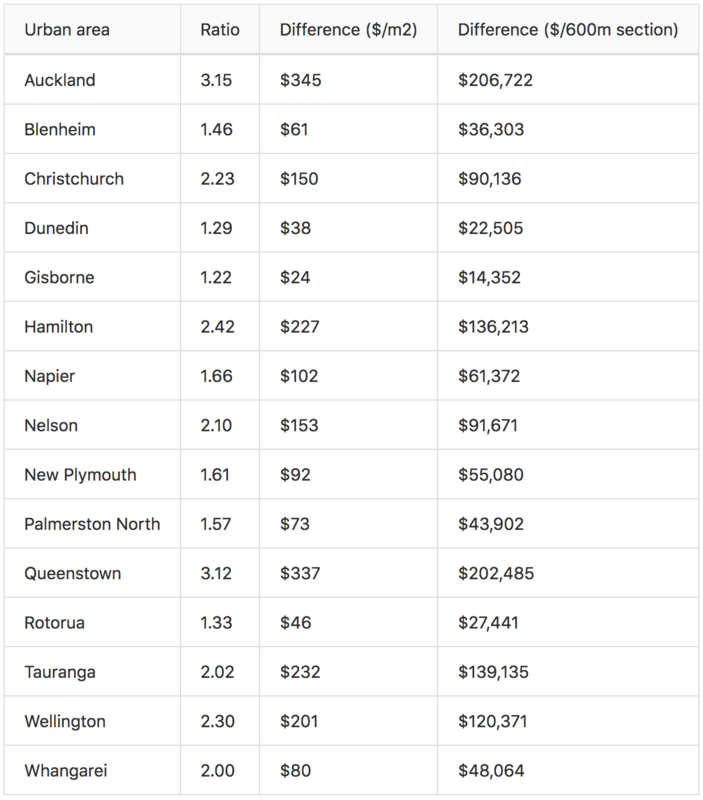 This table shows Auckland, Queenstown, Tauranga and Hamilton all have the highest price differential which is as expected; these are the urban areas with highest increase in demand in recent times. This tells us that those are the areas with the largest constraints for urban growth and possibly deserve further policy exploration. In summary, the NZLVM manages to synthesise and analyse several complex spatial and non-spatial data sets to help inform central government policy and aid implementation that will hopefully help meet the needs of people and communities now and in the future. Furthermore, it provides a reproducible tool kit which enables the users to re-run the analysis in the future and also build on and expand the model. A web application developed by MBIE which presents a lot of the results of NZLVM along with some other price indicators.